10 Things You Should Know to prevent a Burglary. Sign up now and receive! What is Security Specialists , and how can it help you? What makes us different? Why Choose Security Specialists Alarm Systems? We know you have a choice to make, and as the local choice we’ve got to work harder to earn your trust and your business. We believe we are the security alarm company in whom you can place your trust because we only use nationally-known manufacturer’s equipment from GE/UTC, Honeywell, and DSC. 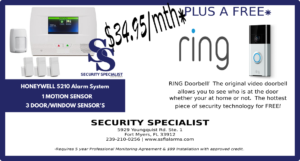 Our alarm system equipment is tested, proven, and comes with a lifetime warranty. Sign up for the free report now!